Is the cost of the hire for the duration of the show? Cost of hire is up to the duration of the exhibition, not exceeding 10 days. General Hire costs are not exceeding 7 days. Long term rates can be negotiated. Why do I pay a minimum of $80 for transport for one item when you have a whole truck of furniture is going out to the show? The minimum transport fee covers much more than just transport, it is for transport to the venue, cleaning and maintenance, delivery and placement onto your stand, and collection and return to warehouse. What is the damage waiver, does it insure the goods, is it refundable and is it compulsory? The damage waiver is 9%. The Damage Waiver is payable to cover the cost associated with the normal wear and tear of the equipment. It does not cover misuse or theft of the equipment and so it does not insure the goods being hired. It is compulsory and it is not refundable. What is the credit card surcharge and minimum cartage? The credit card surcharge is 2% and minimum cartage is $80. What is the Electrical Installation Fee? The electrical install fee is 30%. This covers much more than just the labour to install the item, it is for transport to the venue, infrastructure to connect your item to the venue electrical network, and collection and return to warehouse. What is the Compulsory Safety Inspection Fee for power orders? This is a compulsory inspection that must be carried out at certain shows to ensure all electrical equipment is safe and adheres to Australian safety standards. A portion of the cost is passed onto exhibitors; the costing may vary from show to show. In most cases this inspection is requested by the venue before the commencement of shows. Why is GST applied to my order? The GST (Goods and services tax) is an Australian government tax of 10% that applies to goods and services sold or consumed in Australia. As ExpoNet is an Australian based company the GST must be applied to all orders. Why cant you tell me the exact time my furniture will be delivered to my stand prior to the show? Whilst we do our best to give exhibitors an accurate time frame for their furniture deliveries, there are a range of factors which impact on delivery times, many of them are out of our control. Usually there are several trucks delivering equipment over different time spans, we cannot always be certain which truck has your furniture. Congestion at the loading docks; there are many trucks, not just our own, all needing access to docks at the same time; we cannot predict the precise time we will be able to unload. Traffic congestion on roads in major cities is always an unpredictable variable. Speed of the stand build; the stand build may not always go according to plan, we cannot deliver furniture until the stands have been completed. Can I pick up my own furniture? No, unfortunately due to insurance issues and delivery commitments, all transport of equipment must be carried out by ExpoNet staff. Why will I be charged separately in regards to extra charges for my furniture and av order? We quote as one but it will appear on the invoice separately because AV charges are at different rates to furniture charges? Vector artwork is resolution independent and can be enlarged or reduced without loss of quality .cdr, .eps, .ai are acceptable. Bitmap images should be supplied at 150 dpi at finished size, .tif, .psd, .cpt, .jpg are all acceptable. How heavy are the products you wish to place on the shelves? Consider exactly what you wish to display and get an idea of the combined weight of the products. If the overall weight is substantial (see FAQs for details on weight limitations) then the wall may need to be reinforced to provide greater support. Your stand may be built using one of two systems, Octanorm or Corinthian. This will affect some of your options with regard to shelving. You need to find out which of these systems your stand is being built in before you can make decisions about placement of your shelves. To see an example of each system go to Exhibition Stands on the ExpoNet website and select the Modular Stands option. It may help to know whether your stand is an inline, corner or peninsula stand. This may also affect where you can place your wall mounted shelving. The size of your stand will also have an impact on where you can position shelving on your walls, a common stand size is 3 metres x 3 metres, however it could be 3 metres x 6 metres or a number of other sizes. If you are taking a standard booth, the dimensions will be specified in your Exhibitor Kit. Otherwise, the dimensions of your stand should be specified in the documentation from your Organiser. Are you planning to remove the fascia board on your stand? Removing the fascia board will reduce the support and stability of your stand and reduce the ability to support heavy objects on your wall mounted shelving. What is directly behind the wall panel on which you plan to attach your wall mounted shelving? Is it an aisle way or another stand? If it is another stand which also intends to place wall-mounted shelving on the same panel this may affect your options. Refer to the floor plan provided by the Organiser for further details. Where can and where cant I place shelving? Octanorm: It is best to place shelving on all panels except for any corners. If you really want shelving in the corners you must be aware that they will not be in a straight line or sit flush. Please refer to our gallery of photos. Corinthian: It is best to place shelving on all panels except for any corners, as shelving in the corners are very difficult to get in a straight line or sit flush. If you really want shelving in the corners you must be aware that they will not be in a straight line or sit flush. Please refer to our gallery of photos. How do I specify exactly where I want my shelving to be installed? On the last page of your exhibitor kit there is a Layout Form. Mark in the required location on this form and return to ExpoNet. Our staff will ensure the details are passed on to the Project Manager for installation. How can I find out whether my stand is being built in Octanorm or Corinthian? Information about your stand is detailed in your Exhibitor Kit. If you do not have an Exhibitor Kit, ask your Organiser or visit the website for your show for build details. Why cant I put shelving in the corners? It can be done but it may be difficult to place the shelves making it difficult to display your products. What are the dimensions of the shelves? Octanorm shelving dimensions: W 990mm x D 300mm. Is there a limit to how many shelves I can have? Up to 4 shelves per panel, depending on where you start, if you put the bottom shelf quite low. If the top shelf is too high you may not be able to reach it. We recommend the lowest shelf to be placed about 750mm and top shelf a comfortable height where you can reach it. Positioning inside depends on the height of the product you want to put on it. e.g. wine bottles. How far apart are the shelves spaced and can I change this if I want? Unless specified otherwise, the installers will evenly space the shelving around chest height, around 30 cms apart. 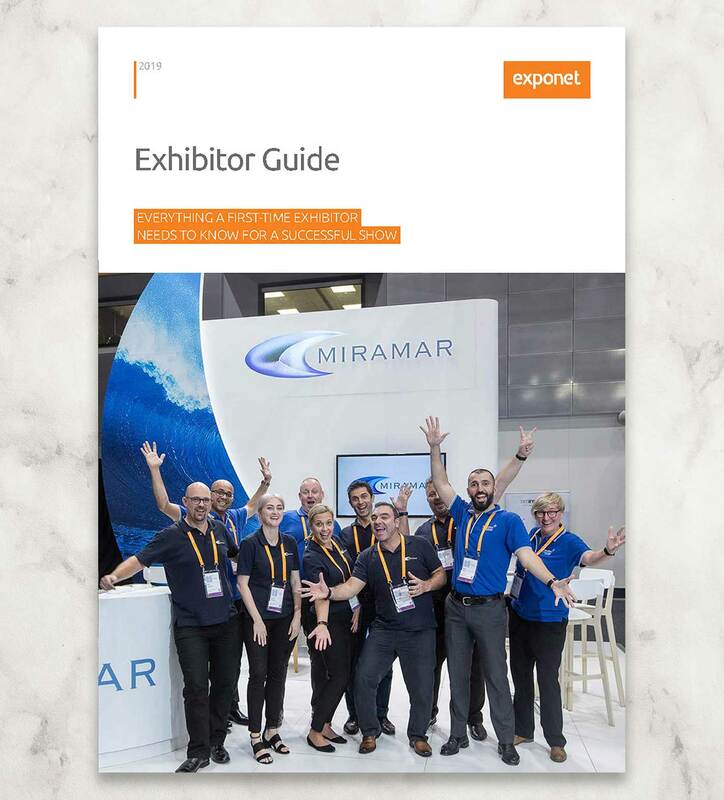 If on arrival at your stand you would like to change the spacing, this can be arranged by asking one of the ExpoNet staff onsite or visiting the ExpoNet Customer Service desk. Why cant I have sloping glass shelves? There is no lip on the lower edge of the glass shelves so anything placed on these would slide off. Is there a limit to how much weight I can put on each shelf? You can have up to 7kgs on each of the four shelves (weight needs to be evenly spread across the width of the shelf. If a single 7kg object is placed in the centre of the shelf it may cause the shelf to sag. What is the angle of the sloping shelves and can I change this if I want? Octanorm sloping shelves are adjustable. However Corinthian sloping shelves are fixed at an angle of 45 degrees. Get the answers on all things sparky before your next exhibit. The technical nitty gritty for Organisers and Exhibitors. We offer exhibitors and organisers a reliable power source which includes the latest technology and highest quality equipment which will save you time and money - PLUS the added peace of mind knowing that delegates and visitors to your event will be safe around the venue. • 630amp distribution board – These boards have been custom made for the larger power requirements of custom stands and are ready to supply concerts and similar events with capability of distribution to 160-400amps, 100-250amps, 3 x 63-160: all connections in coming and out going are powerlock connections. Protection is settable and the current is monitored including neutral protection through NSX type breakers with displays and energy monitoring. Apart from distributing / cascading power the feature of this board is total discrimination and energy monitoring on every outlet. • 400amp distribution board – These boards can be powered up from a generator up to 400amps, then we can cascade the power in seconds in whatever configuration required: 250amps through the powerlocks out, 80 to 125amps settable, 63amps, 50amp, 40amp and 32amps. Note: one version of this board is capable of distributing an additional 400amp from the same source. • 250amp distribution boards – These boards also have the capabilities to cascade the power to 125amp, 64amp, 50amp, 40amp and 32amps. • We have a wide range of different indoor & outdoor weather protected distribution boards to power up clients equipment from variety of sources. ExpoNet has invested and developed a special 3 phase flat cable that can be installed under the carpet in public areas reducing trip hazards for exhibitors and the public. • Output power is only 18 watt compared to 120 watt from the traditional par 38 globe. What size power point do I need to order? Use the wattage information on your appliance to determine the size of the power outlet you require. If you are unsure, contact ExpoNet;s Exhibitor Services Department who will be happy to assist you. ExpoNet can accommodate whatever 3 phase powerpoint you require, from 10amp 3 phase upwards (this is dependant on the venue). Do I need all my power in one place? a. For example, if you have an EFTPOS machine and a desk lamp and want them in separate locations it is recommend you order 2 x 4 amp power points. If you had these same appliances in the one spot you could order a 10amp and use a 4 way board. b. For example, if you have an urn and an EFTPOS machine in one location, it is recommended you order 1 x 10amp & 1 x 4amp powerpoints. (In this case, to use 2 x 4amp powerpoints on this size load is insufficient). What lighting and power do I get with a space only stand? Generally space only stands are just that - space only. Lights and power need to be ordered separately unless otherwise indicated in your exhibitor information. What lighting and power do I get with a shell stand? Normally lighting is supplied on a stand floor size of ratio of 2 per 9m² but this can vary from exhibition to exhibition. Some shell stands are provided with a power point but not in all cases. It is always advisable to check with your exhibition coordinator or account manager. What happens to my lighting if I dont require a fascia board? Generally as a standard a 300W arm light would be attached to the back wall of the stand. This will vary from show to show. It is best to check with your account manager or coordinator as they will be able to assist you with a lighting solution. I will be having a raised floor constructed on my stand. How will this affect the power supply? Please contact us - power can be run under your flooring in most instances but we require notice prior to construction of your floor so that cabling can be run before access to the floor pit is blocked. I have equipment from overseas. How do I arrange connection if it is not compatible with Australias power supply? The power supply in Australia is 240 volts at 50 hertz single phase using a three pin plug and socket. We can supply transformers and plug converters if required to obtain compatibility with US/European plugs and sockets. Yes - but you will be need to order the appropriate power supply to run the total wattage of your lights (i.e. 4amps = 1000 watts, 10 amps = 2400 watts, 15amps = 3600 watts). All your equipment including leads and lights will need to have tags to indicate they have been tested prior to the event. Please note that the major Exhibition Centres do not allow the use of 500 watt halogen elements in your lights. These must be restricted to 300 watts. No lighting or other equipment is to be attached to the ExpoNet light track. We require notification of the name of your electrical contractor (if used) or a contact number if there is a problem with lighting you have installed during the show. Will ExpoNet hook up my equipment to the power supply? No - you will need to arrange installation and connection of your own equipment. Dont forget to bring to the show things like extension leads, power boards etc. Double adaptors are not permitted in exhibition venues. The last time I exhibited I had a switchboard (power board) on my stand. As I dont want this again, what can be done? Switchboards are the only means of power supply to the whole block of stands of which your stand was a part. Power supply comes from a pit in the floor to these boards from which we distribute power to the block. If you cannot accommodate the board in the design of your stand, we can attempt to place it in a better position if notified early enough. This is dependent on the position of the pit, the length of cabling and your neighbours. We will at all times attempt to help you with this problem but sometimes are unable to avoid this because of the above restrictions. There is a socket up on top of the wall of my stand. Can I plug in to this? o. These sockets are for ExpoNet use only and are used for distribution of power supply for the whole block of stands. You must order power if you require it on your stand. Connection by the exhibitor will cause power overloads that have not been allowed for during distribution of the power. Can I have 24 hour power supply? Yes. Please advise us of your requirements on your order form. I have ordered lights - do I need to order power to run them? No. The cost of powering the lights you order from us is included in the price. What type of light should I order? E.G. : If you have a banner/ signage on your back wall (3m) 1 x 300w light would be adequate. For a 6m wall 2 x 300w lights would be adequate. Being on an arm they are higher than other options / less heat than the 300w track or surface mount. This light is mainly utilised from the front fascia lighting back into your stand. Good as a general floodlight. At 2.4m it can be very hot - a better option is the 300w on arm because of the height advantage. Ideal for lighting from a truss style, hanging from the roof of the venue or on a 5m post & base. How do I advise ExpoNet where I would like my power and lighting to be placed? Please use the Stand Layout Form included in your exhibitor kit to indicate where you would like your items to be installed. This form is a must to be returned to our office, so that the electrics can be installed in the correct location and the floor plans can be marked out prior to the show. What is included in a standard stand package? The standard stand package is a (3m x 3m= 9m²). Exhibitors would get 1 x 4amp power point & 2 x 150w Spot on track lights. Please note that the standard package can vary. For E.G. : 2 x 150w Spot on track and no power or 1 x 4amp power point and no lights. The details for your show will be included in your exhibitor kit, if you have any trouble locating this information, please call ExpoNet to confirm these details. What is the standard allocation of lights? • In 95% of cases our DVD players will play most DVDs which are designed to be played in a DVD video player. They will not run presentations burnt on to a DVD. To play these you will need to run through a Laptop computer with a DVD player built in. • We supply all cabling required. • You will be quoted as one but invoiced separately in regards to extra charges for furniture and av order because AV charges are at different rates to furniture charges? • Vector artwork is resolution independent and can be enlarged or reduced without loss of quality .cdr, .eps, .ai are acceptable. Bitmap images should be supplied at 150 dpi at finished size, .tif, .psd, .cpt, .jpg are all acceptable. • Click here for the ExpoNet Artwork, Design and Signage Requirements document.